The 8.5 a.m. electric passenger train Seaford to London Bridge, which had approached the station on the Up Through line, overran the Inner Home signal at Danger and collided at a speed of about 15 m.p.h. with an empty train standing at No. 14 platform, awaiting signals to leave for New Cross Gate. I regret to report that the motorman of the incoming train was killed, together with a passed fireman who was in the cab with him, learning the route; an intending passenger received fatal injuries, when the rear of the stationary train was driven on to the concourse. Seventy-four passengers, two railway servants, one member of the Pullman car staff, and two employees at a railway bookstall, were injured or suffered from shock ; of these, three were detained in hospital. 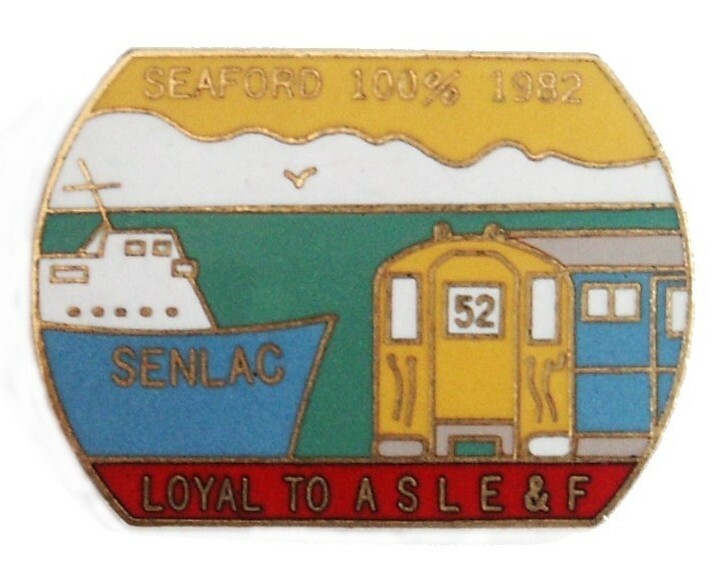 There were between 300 and 400 passengers in the Seaford train, which consisted of a 6-coach set from Seaford and a 6-coach set from Ore, made up at Haywards Heath into one train of 12 coaches, including four motor third brakes ; the length over buffers was 791 ft. and the weight 509 tons. The coaches were standard Central Section main line electric service corridor stock, except the ninth, which was a Pullman car. The motor third brakes and the Pullman cars were of all-steel construction; the remainder were of composite construction with timber framing and steel panelling on steel underframes. The Seaford set had been built in 1935 and the Ore set in 1932. Each motorman's compartment extended to the full width of the coach with the driver's control gear on the near side; in addition to the normal exits, another door, opening inwards on the off-side, provided an exit into the guard's van. Heavy-duty self-contained buffers and screw couplings were fitted throughout. Westinghouse brakes operated on all wheels and the overall brake power was 59% of the total weight ; cast iron brake blocks were fitted to the wheels of the motor third brakes, and non-ferrous blocks to all the others. The empty train consisted of 12 coaches of a total length of 784 feet and a weight of 486 tons. The make-up and construction of this train, which was built in 1935, was similar to that of the Seaford train, except for a buffet first coach in place of the Pullman car. The steel headstock of the leading coach of the Seaford train was broken off and driven downwards with the buffers, whilst the solebars were forced outwards by the underframe of the leading empty coach, which overrode it. Both motorman's cabs were telescoped back to the guard's van partitions. The empty train, the brakes of which were off, was driven forward into the buffer stops, where the body and underframe of the rear coach was forced off its motor bogie on to the concourse and demolished a bookstall before coming to rest 23 feet beyond the end of the platform. 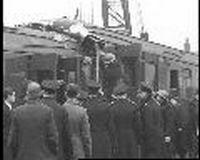 The damage to the other coaches of both trains was slight; the only wheels derailed were those of the leading motor bogie of the Seaford train and of the motor bogie which hit the buffer stops. Except at the point of impact, there was no interlocking or overriding of buffers and none of the window lights was broken in either train. Motorman E. J. Watson, of the Seaford train, and Passed Fireman B. H. Peddlesden, who was travelling with him to refresh his route knowledge, were both trapped, and, in spite of strenuous efforts by railway and N.F.S. staff, died of their injuries before they could be released. First aid was rendered immediately to injured passengers and staff, whilst railway doctors and L.C.C. ambulances were on the scene within 8 minutes. The circuit breakers, controlling electric current to Nos. 10, 13 and 14 platforms, opened on short circuit at 9.35 a.m.; thereafter hook switches applicable to the various lines in the area were opened and closed as required, until rescue and breakdown operations were completed. All traffic into Nos. 8 to 17 platforms on the Up and Down Through and Up Local lines was stopped, but by 9.50 a.m. the Up and Down Through lines were re-opened to serve Nos. 8 to I1 platforms and by 11 a.m. these platforms could also be served by the Up Local line ; normal working had been resumed throughout the station by 7.40 p.m. Traffic was considerably dislocated by the accident; 24 trains had to be cancelled, and the working of 54 others was altered. (a) The Through group, Nos. l to 7 platforms, served by the Eastern Section lines. (b) The Low Level group, Nos. 8 to 11 platforms, served by the Eastern and Central Section lines. (c) The Central Section Main Line group, Nos. 12 to 17 platforms, served by the Central Section Through, Local and South London lines. (d) The South London group Nos. 18 to 22 platforms, served by the South London lines and with access to and from the Through and Local tines. Nos. l, 2 and 3 Down lines (Eastern Section). Nos. 2 and 1 Up lines (Eastern Section). Down Local, Down Through (Central Section). Up Through, Up Local (Central Section). Down and Up South London lines (Central Section). The relevant signals, track circuits, points, platforms, etc., are shown on the plan. The six Central Section lines are straight for just over a mile approaching the station, where they curve to the left at the facing junctions and then fan out through the controlling sections A, B, C, etc., to the Main, Line and South London terminal platforms. The Main Line platforms vary in length and only Nos. 14, 15 and 16 are long enough to hold a 12-coach train. Ordinary type buffer stops are installed at the end of each platform line ; consideration had been given to the provision of hydraulic buffers,but, owing to their length and the limited space available, they could not be fitted in without serious interference to traffic working. With the exception of No. 11 platform, all tracks are electrified on the third rail system. Multiple-aspect colour light signals are installed throughout the area, with continuous track circuiting, whilst, between Bricklayers Arms Junction and the London Bridge Outer Homes, there are a number of three-aspect automatic signals. The incoming running signals are mounted on gantries 16 ft. above rail level and are so arranged that individual signals are sited to the left of the line to which they refer. Route indicators of the "Music Hall" type are installed at the Intermediate and Inner Homes ; at the former a letter l l in. high is displayed to indicate the Section (A, B, C, etc.) through which the route is set ; at the latter, platform numbers of similar size are illuminated. Two-aspect shunting or subsidiary signals, showing red or green lights, are provided either on the ground, such as No. 140, or on a gantry, such as No. 176. The siting of the Outer and Intermediate Home signals is excellent, but the view of the Inner Home gantry applicable to Sections D, E and F, is obstructed at long range by the other gantries in front of it and by its alignment, owing to the divergence to the left of the D to F Section tracks. A clear view for 200 yards is obtained, however, from a motorman's cab when traversing crossover No. 165 from the Up Through line to E Section-the route taken by the Seaford train. On this gantry the distance between the D sad E group Home signals is 11 ft. and between the E and F signals 13 ft. 6 in. ; there is no difficulty in distinguishing them. All movements at London Bridge are controlled from one large signal box, situated to the west of the Central and Eastern Section Inner Home gantries, and between the lines leading to the Low Level Station and No. 12 platform. This box contains 277 miniature working levers, 28 spares and 6 spaces; the levers are mechanically interlocked, with electrical controls operated by the track circuits. There are no unusual features about the inter-locking and controls, the running signals require shunt signals ahead to be " Off," in addition to the route being correctly set up, whilst the track circuit controls on the Inner Homes are such, that a green aspect is displayed only when the line is clear to the buffer stops, yellow when it is clear to the last track circuit, and red when any other platform track circuit is occupied. Some 2,300 movements are dealt with during the 24 hours, and in the peak period 180 trains are handled in an hour. During the busy periods, the staff on duty in the box consist of a Yard Inspector in general charge, six signalmen and four booking boys. Two signalmen are responsible for working the Eastern Section traffic through Nos. 1 to 7 platforms, one man works the South London traffic, and three control movements in and out of the Main and Low Level Stations; of these three, one handles the inwards traffic, another the outward traffic, and the third controls movement through D to H Sections and co-ordinates the work of the other two. On the morning of 23rd January, trains were arriving on time or one to two minutes late, but the heavy peak traffic into London Bridge station was working normally. Yard Inspector S. P. Elliott was in general charge, with Signalman T. J. Hulbert controlling movement through Sections D to H; Signalman W. Knight was dealing with outgoing t r a c from Nos. 8 to 17 platforms and Relief Signalman F. Eldridge was operating inward movement to the same platforms; in addition a Relief Signalman was learning the frame under Hulbert's supervision. All the above-named men gave clear and consistent evidence, which is summarized in the following paragraphs. 9.35 a.m. In 8.5 am. ex Seaford Overran Inner Home Signal. In addition, the 8.14 a.m. ex Holborn Viaduct, travelling on the Up Through, has been described at 9.32 a.m. and was destined for No. 8 platform. (i) Despatch the empty train from No. 15 platform, through crossovers Nos. 127, 164 and 51, to the South London line. (ii) Route the Seaford train through crossover No. 165 and points No. 139 to E Section Inner Home signal and then, when the line was clear, allow it to enter No. 16 platform through points No. 136 normal and crossover No. 118 reversed. (iii) Despatch the empty train from No. 14 platform (due to depart at 9.30 a.m.) via F Section to the Down Local line. He therefore reversed lever No. 136 to enable Knight to set crossover No. 127 for the departure of the empty stock from No. 15 platform. Hulbert then cleared Outer Home No. 175 and, as soon as the Tattenham Corner train ran into No. 10 platform, he reversed points No. 139 and cleared shunt signal No. 140 and Intermediate Home No. 184, so as to allow the Seaford train up to the Inner Home gantry. While this train was approaching, he reversed points No. 134 in readiness for the departure of the empties from No. 14 platform and was waiting to restore No. 136 to normal, when the overrun occurred and the points were held, set for the occupied platform. In the meantime Knight had been waiting for the 9.34 a.m. empty train to clear tract circuit No. 110 so that he could replace lever No. 127, thus enabling Hulbert to restore No. 136 to normal. He was not sure whether he moved this lever before the accident and evidence regarding the position afterwards is not conclusive. In any case, the time available for these movements was very short probably less than 20 seconds-as the leading coach of the incoming Seaford train had passed crossover No, 165, when the rear of the empty stock was still on the track circuit. Hulbert saw the Seaford train pass the Inner Home gantry at a speed which he thought was about 20 m.p.h. and realized it was overrunning ; he called for Rags, rushed to the window and shouted to the driver, but he was too late to stop him. He then gave the " Obstruction-Danger " signal to Bricklayers Arms Junction and acted thereafter under the instructions of Yard Inspector Elliott. Guard W. G. Watmore, who is 64 years of age, was travelling in the rear guard's compartment of the Seaford train, and was knocked down by the collision. He suffered from shock and his evidence, which he was not able to give until a month after the accident, was hazy and not altogether reliable. He stated that he had a good run from Haywards Heath, where the Ore section was attached in rear, and the brakes of the whole train were satisfactorily tested. Bricklayers Arms was passed 2 ½ minutes late and thereafter the train was checked by signals at yellow, until it was stopped for about 2 minutes at signal A.5 (automatic) at danger. He saw both the Outer and Intermediate Homes showing yellow, but did not notice the letter on the route indicator at the latter signal. Owing to curvature of the line, he could not see the aspect of the Inner Home from his compartment, either through the periscope or window, but, just after the leading coach had passed the Intermediate Home, he felt the train accelerate and thought Driver Watson must have seen the Inner Home clear. Watmore thought he saw shunt signal No. 140 showing green, but he was so dazed from his fall that he could not be certain of this. He did not see shunt signal No. 135, either before or after the collision. Motorman AC.A. Archer, who had worked the 8.20 am. Brighton train into No. 14 platform at 9.23 a.m., gave a clear account of the accident. He had taken his seat in the motorman's compartment at the country end of the empty stock and was awaiting signals to depart to New Cross Gate, when he saw the Seaford train approaching at normal speed. He thought, at first, it was going into one of the two empty platforms No. 13 or 15, hut, when it was a few yards from him, he realized it was on his line and saved his life by jumping on to the platform. Archer recognized Watson in the driving position of the incoming train and saw a second man leaning against the window on the off side of the cab. As the train approached him, Archer first heard Watson shout and then heard the noise of the escaping air from an emergency brake application. This action, however, was too late to have effect, and Archer estimated that the speed of the approaching train was about 10 m.p.h. at the moment of collision. Motorman A. D. Jupp was in charge of the empty 8-coach train, which left No. 15 platform for New Cross Gate at 9.34 a.m.; as already described; it was routed through crossovers Nos. 164 and 51 to the South London line. On approaching the latter points, Jupp saw the incoming Seaford train traversing crossover No. 165 from the Up Through towards E Section. He also recognized Watson in the driving position and saw the second man on the offside of the cab looking through the front window. He was quite confident that Watson was driving, and as far as he could see he was paying attention to his work and was not in conversation. Chief Lineman W. W. Farmer was in the Mess Room, under the signal box, when the collision occurred. He immediately sent Assistant Lineman Farmer to check the aspects of the Inner Home signals, and Lineman Mead to check the position of the levers in the signal box. Farmer noted that all the signals on the Inner Home gantry were showing red aspects, but he did not check shunt signals No. 135 and 140 at this time, because the Seaford train obstructed his view. Mead examined the lever frame as soon as he reached the box, where he arrived within two minutes of the accident. He noted that all relevant signal levers were normal, except shunt signal No. 140, which was reversed and showing a green aspect. Point levers Nos. 134, 136, 139 and 165 were also reversed. Mead remained in the box until 10 am. During the whole of the time he was there he did not see any lever operated in the middle of the frame, either for testing or any other purpose. He was quite confident that the levers of the Inner Homes and shunt signal No. 135 were normal. Farmer, who had spent some time advising his Inspector about the accident, arrived at the box at 9.50 a.m.; he also checked the position of the levers and later tested Nos. 135 and 179, without finding any fault. He explained that the lever of shunt signal No. 140 was back-locked by the occupation of track circuits Nos. 95,96 and 97 ; but the lever of shunt signal No. 135 was free to move. Signal and Telegraph Sub-Inspector G. W. Houlden arrived at the signal box at 9.55 a.m. and checked the levers; he confirmed that all the relevant signal levers, including No. 135, were normal with the indicators showing red aspects, except No. 140 which was reversed and showing a green light. He left at about 10 am. and then verified these aspects by visual inspection of the signals, when he walked the full length of the two trains to examine signalling equipment f o damage. All this independent evidence, regarding the position of levers and signals, confirmed that of Yard Inspector Elliott and the signalmen, who were quite emphatic that all the Inner Home signals both main and subsidiary and shunt signal No. 135 were at Danger. On the other hand, when Carriage and Wagon Inspector B. Dart, in company with Chief Inspector Nelson and Assistant Scammel, were examining the Seaford train stock at about 9.50 a.m., Dart noticed a shunt signal showing a green aspect and pointed this out to his colleagues, both of whom confirmed his statement. In spite of considerable cross examination all three witnesses were confident that the signal in question was No. 135 and not No. 140. Brake Inspector A. E. Garland tested all the brakes of the Seaford train, except those on the leading coach. He found all apparatus working satisfactorily and the brake blocks in good order. The driver's brake valve was afterwards removed from the damaged leading coach and, although the handle was badly bent as a result of the collision, the valve was found to be in good working order. There is no doubt, however, regarding the indications displayed by the approach signals during the passage of the train. Outer Home No. 175 was held to yellow by the red aspect of Intermediate Home No. 184, which could not be changed until the 8.44 am. ex Tattenham Corner had Cleared track circuit No. 77. Even after that, the Intermediate Home could only show a yellow aspect, with the route indicator displaying the letter E, as it was controlled by the Inner Homes, Nos. 177/181, at Danger, and no other route indication could be given with the road set through crossover No. 165 and points No. 139 reversed. Shunt signal No. 140 was correctly showing green, having been reversed in order to release No. 184, and shunt signal No. 176 was locked by No. 184; the levers of Inner Homes, Nos. 177/181, must all have been in the normal position ; the route from E Section was set to No. 14 platform, due to Hulbert's inability to replace lever No. 136, hence the only signal of this group which was free of mechanical interlocking was No. 179, and it was held to Danger by the empty train in No. 14 platform occupying track circuits Nos. 88, 89 and 90. It will be seen, therefore, that the Seaford train was correctly signalled and should have been brought to a stand at the Inner Home gantry, the signals on which were clearly visible for 200 yards, having come into full view after the train entered crossover No. 165. The route via E Section is constantly used by trains running into Nos. 14 to 16 platforms and the stop at the Inner Home is by no means unusual. Consequently, Motorman Watson, a man of 37 years' experience, should not have been taken by surprise at finding this signal at danger. There is no evidence, however, to suggest that he attempted to stop before he ran into No. 14 platform. On the other hand, Guard Watmore said he thought the train accelerated after passing the Intermediate Home, and hence, it is important to consider whether any adjacent signal might have been showing a green aspect, which Watson could have mistaken. I am satisfied, however, that all relevant signals were at danger for the reasons given in the next two paragraphs. The G Section Inner Homes, Nos. 225 to 228, were locked normal by lever No. 139 reversed. F Section Inner Homes, Nos. 114/123/126, were free of mechanical locking, but, since No. 14 and 12 platforms were occupied, the only route which could have been set was to No. 13 platform, through points Nos. 132, 145 and 162 all reversed, a d of these No. 162 was locked normal by No. 139 reversed. Hence the Signalman could not set the route and even if it had been free, there was no reason for him to do so, because the Seaford train was too long for No. 13 platform and the empties from No. 14 platform were due to leave through F Section in the opposite direction. D Section Inner Homes, Nos. 168i170, were held at Danger by the passage of the outgoing 9.34 a.m. empty stock, the rear of which was still on track circuits Nos. 107 and 108, when the incoming Seaford train passed it. No shunting movements were taking place and so there was no reason for either of the subsidiary signals, Nos. 146 and 167, to have been cleared; they were at-Danger when examined by Mead and Farmer within two minutes of the accident. Inspector Dart and his two colleagues, however, stated that shunt signal No. 135 was showing green, but it will be appreciated that they did not see it until 9.50 a.m.-a quarter of an hour after the accident. Long before they arrived, Lineman Mead, an independent witness, and the signalmen concerned had examined the lever frame and all were confident that No. 135 was in the normal position. Furthermore, its operation was not required for movement from E Section to No. 16 platform, the intended destination of the Seaford train, nor could it have been left " Off" after the arrival of the 8.44 a.m. ex Epsom in No. 13 platform at 9.25 am. because it had to be replaced before points No. 134 were reversed. I am, therefore, satisfied that this signal was also at Danger when the Seaford train passed, and, either it was cleared temporarily by some person in the cabin after the accident, or Inspector Dart mistook it for No. 140 which was correctly showing a green aspect. I have no criticism regarding Hulbert's action in setting up routes in anticipation of future movements, for unless this were done, it would be quite impossible to work a busy station, such as London Bridge, during peak traffic. The routing of the Seaford train was quite normal and there was no question of a last minute alteration. After consideration of all the circumstances of this case, I can only conclude that Motorman Watson could not have been keeping a vigilant lookout as hi approached the Inner Home signals. It is possible that, when he saw shunt signal No. 140 at Green, he assumed the Inner Home would also be clear, although, if he had looked up at the gantry, he could not have missed seeing such a conspicuous stop signal. Fireman Peddlesden, who was correctly travelling in the motorman's cab in order to refresh his route knowledge, might have warned Watson that the signals were at Danger, but, if he did so, his warning was either too late or disregarded. It is more probable that he, also, did not notice the signals, and the possibility tha: the two men were in conversation and so distracted each other's attention cannot be entirely &led out, although Motorman Jupp thought they were attending to their work. when he passed them near crossover No. 165. Motorman Watson was 54 years of age and entered the Locomotive Department as a cleaner 37 years ago (29.04.1911). He was appointed locomotive driver in 1925 and Motorman in 1935; he had a fair record. Fireman Peddlesden was 45 years old and had 28 years' service (9.02.1920) with an excellent record. According to his medical history, Motorman Watson suffered from a duodenal ulcer in April, 1946. He was, however, passed fit for day duty seven weeks later, and thereafter, he was medically examined every two or three months, till he was passed fit for full normal duty in May, 1947. There was no indication that he suffered from any illness on his last fatal journey; he appeared to be in complete control when he was seen by Motormen Jupp and Archer, and the post mortem examination showed that he died from his injuries and not from any other cause. In view of the risk of serious or fatal injury in a collision it is desirable to provide a means of escape for a motorman, if this is practicable. On the more modern suburban electric trains and on most of the Brighton, Eastbourne and Portsmouth main line stock of the Southern Region, access to the guard's van has been given through a door on the off side, opening into the motorman's compartment, and I understand that this arrangement is to be maintained. A door of this type was provided in the cab of the Seaford train, but Passed Fireman Peddlesden, who was standing with his back to it, apparently did not have sufficient time to pull it towards him and escape. It is for consideration whether this door could not be provided on the near side, behind the motorman's seat, and opening outwards into the guard's van. The effects of this accident would have been reduced and some of the fatalities might not have occurred, if hydraulic buffers had been provided. Unfortunately, the additional space required for their installation is such that traffic working would have been severely affected by a reduction in the length of platform lines. However, the advantages to be gained from reduction of shock in the case of both major and minor impacts are such that I have no doubt the question of provision of these stops will be reviewed when the station, which suffered severe war damage, is rebuilt. This collision provides another example of the inexplicable failure of the human element. I can find no adequate reason to account for the motorman's lapse and I have no recommendations to make regarding the signalling arrangements.